If you love a beautiful sunset view, come to BP Villa. This villa offers a heated pool, covered porches, and open decks so you’ll have plenty of space to take in the view. Plus, the beach is only 50 steps from the house. What makes this villa even more special is the unique materials it’s made with - the natural shell stone floors, Kabulalli and Brazilian cherry woods, and Anguillan stone floors give the place a bright, upscale warmth. 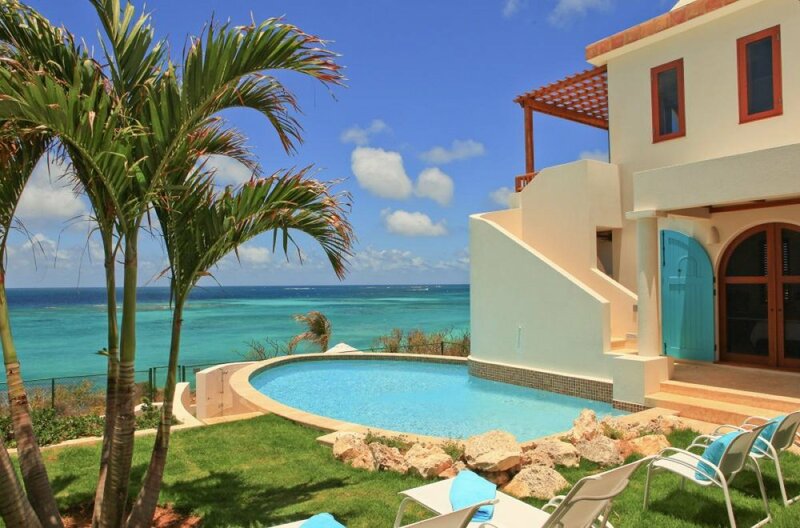 BP Villa is just a few feet away from Shoal Bay East, and enjoys stunning sunsets over the sea. This villa is great for couples and families, with private bedroom retreats and tons of outdoor space. Large, turquoise doors welcome guests into the courtyard. A staircase leads down to the sunken living and dining area, which has arches along three of the walls and a fire pit. A small gazebo shades the outdoor kitchenette, which has a sink, mini fridge, and prep counter. The covered porches and open decks have panoramic ocean views, and the round pool enjoys nearly constant sunshine. A lounging lawn borders two sides, the villa borders the third side, and the ocean borders the fourth. The oceanfront side has a stone path that leads down to a beach pavilion and the rocky coastline. BP also has a gas grill for al fresco meals. This villa features a unique Mediterranean design made up of a dome roof, a barrel roof, verandas, and pergolas. The indoor spaces are large and airy, with custom furniture designed by the owners. Natural shell stone floors, rich Kabulalli and Brazilian cherry woods, and native Anguilla stone walls run throughout the interior. Board games and a library are available for guests’ entertainment. Each of the air-conditioned bedrooms has an ensuite bathroom, an outdoor shower garden, a flatscreen TV, and a DVD player. The ensuite bathrooms feature Kiehl’s bath products and indoor showers. The upper level has a king suite and a twin suite that can be converted into a king suite. The main level has a king suite and queen suite. BP Villa is 50 steps from the white sands of Shoal Bay Beach. A housekeeper, manager, and concierge run the villa. A/C is in bedrooms only, but the common space is mostly outdoors anyway. Beachfront at Shoal Bay East!!! Taxi is arranged to meet guest at the port of entry (airport or Blowing Point ferry dock) and are greeted by villa staff upon arrival to give a tour and answer any questions. The taxi is at the guests expense. Welcome 7 years or older please.